Shiveluch (Kamchatka): Explosive activity continues. Volcanic Ash Advisory Center (VAAC) Washington warned about a volcanic ash plume that rose up to estimated 34000 ft (10400 m) altitude or flight level 340 . Explosive activity continues. Volcanic Ash Advisory Center (VAAC) Anchorage warned about a volcanic ash plume that rose up to estimated 34000 ft (10400 m) altitude or flight level 340 and is moving at 40 kts in SSE direction. 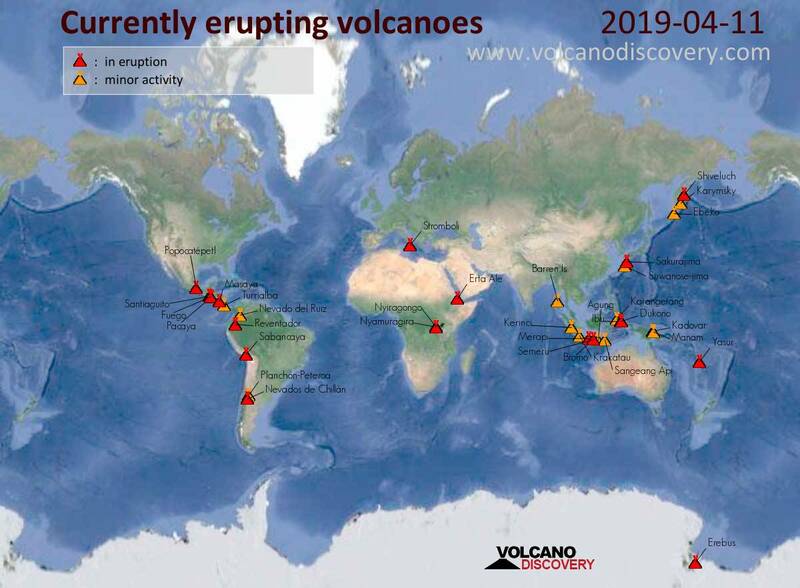 Bromo (East Java, Indonesia): (11 Apr) Volcanic Ash Advisory Center Darwin (VAAC) issued the following report: CONTINUOUS VA EMISSION TO FL100 EXT TO S.
Dukono (Halmahera): Volcanic Ash Advisory Center Darwin (VAAC) issued the following report: VA EMISSION TO FL070 EXT TO NW LAST OBS AT 10/1220Z. Volcanic Ash Advisory Center Darwin (VAAC) issued the following report: VA EMISSION TO FL070 EXT TO NW LAST OBS AT 10/1220Z. Volcanic Ash Advisory Center Darwin (VAAC) issued the following report: CONTINUOUS VA EMISSION TO FL070 EXT TO NW. Agung (Bali): Volcanic Ash Advisory Center Darwin (VAAC) issued the following report: DISCRETE ERUPTION TO FL170 AT 11/1047Z MOV W.
Popocatépetl (Central Mexico): Explosive activity continues. Volcanic Ash Advisory Center (VAAC) Washington warned about a volcanic ash plume that rose up to estimated 19000 ft (5800 m) altitude or flight level 190 . Reventador (Ecuador): Explosive activity continues. Volcanic Ash Advisory Center (VAAC) Washington warned about a volcanic ash plume that rose up to estimated 13000 ft (4000 m) altitude or flight level 130 . Sabancaya (Peru): Explosive activity continues. Volcanic Ash Advisory Center (VAAC) Buenos Aires warned about a volcanic ash plume that rose up to estimated 25000 ft (7600 m) altitude or flight level 250 and is moving at 15 kts in SE direction. Explosive activity continues. Volcanic Ash Advisory Center (VAAC) Buenos Aires warned about a volcanic ash plume that rose up to estimated 25000 ft (7600 m) altitude or flight level 250 and is moving at 10 kts in E direction.